Enock Chiyangwa shares some key insights from the ASFA National Conference and Super Expo held on the Gold Coast in November 2016. The Association of Superannuation Funds of Australia (ASFA) National Conference and Super Expo was held at Gold Coast Convention and Exhibition Centre from 9-11 November 2016. It was a vibrant event with 1,900 delegates attending, among them actuaries, Super Funds’ representatives and stakeholders. The conference opened with a heart-warming performance, of Welcome to Country, from Aboriginal Elder Luther Cora from the Bungarre family of the Yugumbeh speaking group. Setting the tone both vocally and on the didgeridoo he welcomed the esteemed guests. Dr. Michael Easson, ASFA Chair, followed and highlighted the core principles that guide the superannuation industry. “We are privileged to be members of an industry whose purpose is to fight for dignity and adequacy for retirement and fight the disruptive change that affects us all,” he affirmed. The incumbent ASFA chair was followed by former ASFA Interim CEO Jim Minto who spoke of the need to curtail the national fiscal burden, to invest appropriately and transparently. 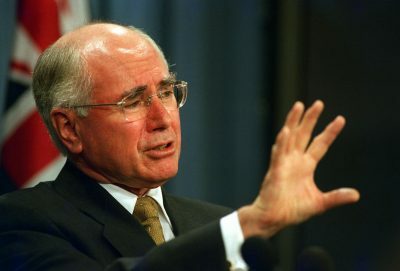 The former Australian Prime Minister, John Howard, highlighted that the superannuation industry is a cornerstone to the Australian economy and is pivotal to preserving the middle class. He argued that the middle class is the bedrock of a nation’s wealth. “Australia is a good example of Western civilisation and democracy,” said Howard, insisting we must be grateful for Australia’s effective political system and resilient financial sector’s contribution to a period of uninterrupted economic growth spanning a quarter of a century. Mr Howard highlighted the need for clear national beliefs and values. “Trust your instincts, believe in your gut feelings and in the end, if you have that inner belief then you ought to give effect to it,” said Howard. Mr Jackson addressed the two major influencers of ageing around the world; declining fertility and the increasing life expectancy and how it affects the developed world and emerging markets. He stated that the monumental challenge for ageing communities is striking a balance between maintaining a good standard of living for seniors without burdening the youth. Further, he quantified the imbalance between taxes and the cost to care of the ageing especially in developed countries and the resulting government benefits cut backs. Rising health care costs were singled out for exerting insurmountable fiscal pressure, impacting savings, investments, GDP and economic growth consequently influencing geopolitics and the global balance of power dynamics. Jackson recommended a global solution to these challenges; sound policymaking, pension and healthcare reform. APAC managing director, Roland Slee, defined block chain, “as the most disruptive technology invented since the internet,” with the potential to be a major disruptor in the financial services industry. Peter Hiom, Vice CEO ASX, described blockchain as a system with a series of databases and ledgers talking to each other and verifying each other’s source of truth. With the sector currently running their own ledgers and databases, blockchain offers easier ways of sharing of information and digitising currency, Hiom explained. Sarah O’Brien from Gateway Network Governance Body premised that blockchain offers “enormous promise and potential for the industry,” with real time access to updated sources of truth and an opportunity to eliminate some of the complexities in the connectivity and transference of information. The overall consensus from panel discussions was that blockchain was a worthy technology for the industry to explore and could equip regulators with a post-trade view of the market. Key themes covered were the political environment, global trends and technology affecting the industry. The conference was a resounding success with networking luncheons and dinners organised for the delegates. Enock is an analyst within the Group Life Policy team at MLC Life Insurance focusing on internal process improvement, risk mitigation and enhancing customer experience. Also he is part of the Actuaries Digital editorial team. He is passionate about drawing strategic insights from big data and product innovation.